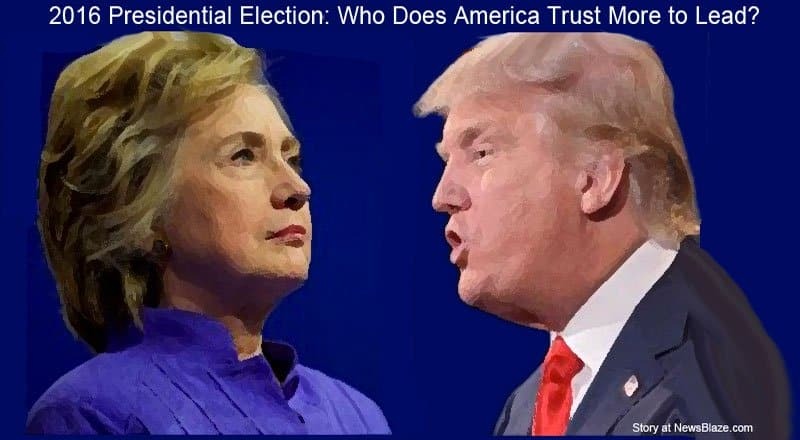 Home USA Politics 2016 Presidential Election: Who Does America Trust More to Lead? 2016 Presidential Election: Who Does America Trust More to Lead? Hillary Clinton and Donald Trump are battling for the presidency in a race that grows tighter by the day. The independent candidacies of Jill Stein and Gary Johnson will take away approximately 12 percent of the overall popular vote. That leaves 88 percent of the likely voters to decide, many of which are entrenched in their decision in mid-September. The election will come down to who can make the least mistakes, score well in the three national debates and explain themselves in the easiest way possible for many likely voters just beginning to take an interest in the race after Labor Day. Then there is integrity, honesty and trustworthiness, all of which Hillary Clinton is getting the lowest rankings of the two candidates. There is no question that a billionaire real estate and business mogul has many issues to address including making his income taxes public, the Trump University scandal, his raw words concerning Mexicans, Muslims, ethnic minorities in general. Trump’s core base of supporters has heard it all and Hillary continuing to strike at his character is landing on mostly “heard that before” voters. His base is loyal and they will vote. On the other hand, Hillary faces a soft base that is not anywhere near as enthusiastic about her candidacy and it shows. There are usually only small numbers of people attending her various speeches. Bernie Sanders brought out the young people and the academics in droves. Had it not been for the super delegates, Hillary may very well have lost the nomination to Bernie. Her base is in Clinton-fatigue mode. There are daily reports of corruption in the Clinton Foundation, her email scandal, various trust issues and even her mysterious health problems. All of these added suspicion to her promise of transparency and the day-to-day change in her diagnosis. Hillary’s documented lies are going to make a big difference in the national debates. She will not be able to dodge the press and will be expected to reply to the expected Trump attacks on her background in politics from 1992-2016. It appears that nothing matters more to the Clintons than money and power, and none of them will ever have enough of either. How can Hillary look at the camera in the first debate and explain how she and her husband, on nothing more than taxpayer-funded public servant jobs are now worth in excess of $300 million dollars. Will the Clintonesque line of reasoning over her ignorance of government laws and national security sway even her biggest supporters this far down the line of investigation and stark facts? Hillary became a disciple of Saul Alinsky during her college years. Hillary was fired from her first job after law school, working for the Watergate Special Prosecutor, for lying and evidence tampering. She should have been charged with a federal crime and disbarred. Hillary’s Rose law firm files that were critical to the White Water investigation disappeared. While she was in Arkansas, Hillary made an extraordinary profit on a one-time cattle futures trade. $5,000 became $490,000 in a short period of time. After coming to Washington as First Lady, the White House security staff quickly learned that Hillary had an irrational and explosive temper. For many years now getting assigned to her security detail has been considered a form of punishment. Travelgate was an irrational and illegal Hillary disaster. Hillary stole expensive artifacts and furniture when they moved out of the White House. Hillary sought and got an eight million dollar book advance just prior to being sworn in as a U.S. Senator from New York. After losing to Obama, another Saul Alinsky disciple in 2008, Hillary cut a deal with Obama to be appointed secretary of State for four years and then be his replacement in 2016. 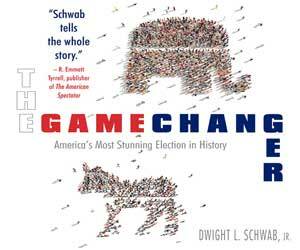 And then the lies, scandals and corruption suddenly soared to extraordinary new levels. When she was appointed secretary of State Hillary continued to surround her with totally unethical sycophants at every level. Many with other approved jobs with questionable companies or organizations, while drawing State Department pay checks. Hillary did not appoint an Inspector General for the State Department while she was secretary of State. After being sworn in, Hillary signed all the required forms regarding State Department communication security requirements and allegedly attended the required training before being issued her required security clearances. Hillary used State Department funds to buy, and used some state department staff to set up her illegal server(s). But the State department claims it would not approve such an arrangement and had no knowledge that it existed. Hillary appointed an unqualified big donor to a sensitive committee. He had to resign immediately when this became public information. Obama has been described by people qualified as a text book pathological narcissist. There are literally tens of thousands of photos and videos available on-line documenting this. In just one factual incident, when it became public knowledge that Hilary was using a private server, she held a brief press conference at the U.N. and said that she choose to use just one device for all her communications for convenience. She actually used multiple devices and multiple servers with many different people and companies involved, many without the proper security clearance. Many consider her to be a national security risk and should not have top classification to the nation’s secrets. Her never-ending attorneys have possession of all her communications without the necessary security clearances or facility security. The attorneys used software known as bleach bit to permanently destroy tens of thousands of Hillary’s State Department communications. The same lawyers are representing all of Hillary’s staff that are being questioned about Hillary’s servers and State Department dealings. This is a very unusual and unorthodox arrangement that clearly implies that their answers to questions are being carefully choreographed. Much of the Clintons’ $300 million cash reserves derive from money from questionable business dealings and foreign governments, many of which are million-dollar plus contributors to the dubious Clinton Foundation. It has taken in over two billion dollars. As secretary of State, Clinton, along with Homeland Security, worked with the Department of Homeland Security to close active investigations into Muslin groups here in America with possible ties to terror groups outside the U.S. Multiple retired Government agents have stated that these investigations could have possibly prevented San Bernardino or Orlando. Clinton’s top aide for years is Huma Abedin, a member of CAIR and other Muslim organizations. Huma is largely responsible for Hillary’s State Department calendar being incomplete and missing information regarding meetings with big donors to the Clinton Foundation. Lastly, she claims she cannot recall many specific events because of a concussion in 2012 supposedly causing her to lose her memory about all these things. In reality, it was the only way for her to avoid prosecution for literally thousands of Federal crimes. This is only the short list of a larger one most certainly in the hands of the Trump campaign. Hillary is not known for her voracious debate style and her notorious secret political life has gone mostly unchallenged by the liberal media in this country. Is Hillary Rodham Clinton to be trusted with choosing three to five Supreme Court Justices and hundreds of federal judges?